Edmund Spenser (/ˈspɛnsər/; 1552/1553 – 13 January 1599) was an English poet best known for The Faerie Queene, an epic poem and fantastical allegory celebrating the Tudor dynasty and Elizabeth I. He is recognized as one of the premier craftsmen of nascent Modern English verse, and is often considered one of the greatest poets in the English language. Edmund Spenser was born in East Smithfield, London, around the year 1552, though there is still some ambiguity as to the exact date of his birth. His parenthood is obscure, but he was probably the son of John Spenser, a journeyman clothmaker. As a young boy, he was educated in London at the Merchant Taylors' School and matriculated as a sizar at Pembroke College, Cambridge. While at Cambridge he became a friend of Gabriel Harvey and later consulted him, despite their differing views on poetry. In 1578, he became for a short time secretary to John Young, Bishop of Rochester. In 1579, he published The Shepheardes Calender and around the same time married his first wife, Machabyas Childe. They had two children, Sylvanus (d.1638) and Katherine. In July 1580, Spenser went to Ireland in service of the newly appointed Lord Deputy, Arthur Grey, 14th Baron Grey de Wilton. Spenser served under Lord Gray with Walter Raleigh at the Siege of Smerwick massacre. When Lord Grey was recalled to England, Spenser stayed on in Ireland, having acquired other official posts and lands in the Munster Plantation. Raleigh acquired other nearby Munster estates confiscated in the Second Desmond Rebellion. Some time between 1587 and 1589, Spenser acquired his main estate at Kilcolman, near Doneraile in North Cork. He later bought a second holding to the south, at Rennie, on a rock overlooking the river Blackwater in North Cork. Its ruins are still visible today. A short distance away grew a tree, locally known as "Spenser's Oak" until it was destroyed in a lightning strike in the 1960s. Local legend has it that he penned some of The Faerie Queene under this tree. 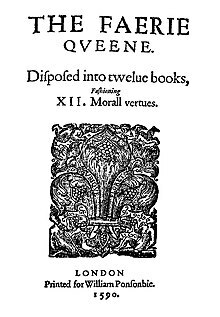 In 1590, Spenser brought out the first three books of his most famous work, The Faerie Queene, having travelled to London to publish and promote the work, with the likely assistance of Raleigh. He was successful enough to obtain a life pension of £50 a year from the Queen. He probably hoped to secure a place at court through his poetry, but his next significant publication boldly antagonised the queen's principal secretary, Lord Burghley (William Cecil), through its inclusion of the satirical Mother Hubberd's Tale. He returned to Ireland. In 1591, Spenser published a translation in verse of Joachim Du Bellay's sonnets, Les Antiquités de Rome, which had been published in 1558. Spenser's version, Ruines of Rome: by Bellay, may also have been influenced by Latin poems on the same subject, written by Jean or Janis Vitalis and published in 1576. By 1594, Spenser's first wife had died, and in that year he married Elizabeth Boyle, who was much younger than him, and originated from Northamptonshire, possibly his native county. He addressed to her the sonnet sequence Amoretti. The marriage itself was celebrated in Epithalamion. They had a son named Peregrine. In 1596, Spenser wrote a prose pamphlet titled A View of the Present State of Ireland. This piece, in the form of a dialogue, circulated in manuscript, remaining unpublished until the mid-seventeenth century. It is probable that it was kept out of print during the author's lifetime because of its inflammatory content. The pamphlet argued that Ireland would never be totally "pacified" by the English until its indigenous language and customs had been destroyed, if necessary by violence. In 1598, during the Nine Years' War, Spenser was driven from his home by the native Irish forces of Aodh Ó Néill. His castle at Kilcolman was burned, and Ben Jonson, who may have had private information, asserted that one of his infant children died in the blaze. In the year after being driven from his home, 1599, Spenser travelled to London, where he died at the age of forty-six – "for want of bread", according to Ben Jonson – one of Jonson's more doubtful statements, since Spenser had a payment to him authorised by the government and was due his pension. His coffin was carried to his grave in Poets' Corner in Westminster Abbey by other poets, who threw many pens and pieces of poetry into his grave with many tears. His second wife survived him and remarried twice. His sister Sarah, who had accompanied him to Ireland, married into the Travers family, and her descendants were prominent landowners in Cork for centuries. I receiv'd nor rhyme nor reason. She immediately ordered the treasurer pay Spenser the original £100. This story seems to have attached itself to Spenser from Thomas Churchyard, who apparently had difficulty in getting payment of his pension, the only other pension Elizabeth awarded to a poet. Spenser seems to have had no difficulty in receiving payment when it was due as the pension was being collected for him by his publisher, Ponsonby. Title Page of a 1617 Edition of The Shepheardes Calender printed by Matthew Lownes, often bound with the complete works printed in 1611 or 1617. The Shepheardes Calender is Edmund Spenser's first major work, which appeared in 1579. It emulates Virgil's Eclogues of the first century BCE and the Eclogues of Mantuan by Baptista Mantuanus, a late medieval, early renaissance poet. An eclogue is a short pastoral poem that is in the form of a dialogue or soliloquy. Although all the months together form an entire year, each month stands alone as a separate poem. Editions of the late 16th and early 17th centuries include woodcuts for each month/poem, and thereby have a slight similarity to an emblem book which combines a number of self-contained pictures and texts, usually a short vignette, saying, or allegory with an accompanying illustration. The epic poem The Faerie Queene frontispiece, printed by William Ponsonby in 1590. Spenser's masterpiece is the epic poem The Faerie Queene. The first three books of The Faerie Queene were published in 1590, and a second set of three books were published in 1596. Spenser originally indicated that he intended the poem to consist of twelve books, so the version of the poem we have today is incomplete. Despite this, it remains one of the longest poems in the English language. It is an allegorical work, and can be read (as Spenser presumably intended) on several levels of allegory, including as praise of Queen Elizabeth I. In a completely allegorical context, the poem follows several knights in an examination of several virtues. In Spenser's "A Letter of the Authors", he states that the entire epic poem is "cloudily enwrapped in allegorical devises", and that the aim behind The Faerie Queene was to "fashion a gentleman or noble person in virtuous and gentle discipline". Spenser published numerous relatively short poems in the last decade of the sixteenth century, almost all of which consider love or sorrow. In 1591, he published Complaints, a collection of poems that express complaints in mournful or mocking tones. Four years later, in 1595, Spenser published Amoretti and Epithalamion. This volume contains eighty-nine sonnets commemorating his courtship of Elizabeth Boyle. In Amoretti, Spenser uses subtle humour and parody while praising his beloved, reworking Petrarchism in his treatment of longing for a woman. Epithalamion, similar to Amoretti, deals in part with the unease in the development of a romantic and sexual relationship. It was written for his wedding to his young bride, Elizabeth Boyle. Some have speculated that the attention to disquiet in general reflects Spenser's personal anxieties at the time, as he was unable to complete his most significant work, The Faerie Queene. In the following year Spenser released Prothalamion, a wedding song written for the daughters of a duke, allegedly in hopes to gain favour in the court. Spenser used a distinctive verse form, called the Spenserian stanza, in several works, including The Faerie Queene. The stanza's main meter is iambic pentameter with a final line in iambic hexameter (having six feet or stresses, known as an Alexandrine), and the rhyme scheme is ababbcbcc. He also used his own rhyme scheme for the sonnet. In a Spenserian sonnet, the last line of every quatrain is linked with the first line of the next one, yielding the rhyme scheme ababbcbccdcdee. Though Spenser was well read in classical literature, scholars have noted that his poetry does not rehash tradition, but rather is distinctly his. This individuality may have resulted, to some extent, from a lack of comprehension of the classics. Spenser strove to emulate such ancient Roman poets as Virgil and Ovid, whom he studied during his schooling, but many of his best-known works are notably divergent from those of his predecessors. The language of his poetry is purposely archaic, reminiscent of earlier works such as The Canterbury Tales of Geoffrey Chaucer and Il Canzoniere of Francesco Petrarca, whom Spenser greatly admired. An Anglican and a devotee of the Protestant Queen Elizabeth, Spenser was particularly offended by the anti-Elizabethan propaganda that some Catholics circulated. Like most Protestants near the time of the Reformation, Spenser saw a Catholic church full of corruption, and he determined that it was not only the wrong religion but the anti-religion. This sentiment is an important backdrop for the battles of The Faerie Queene. Spenser was called "the Poet's Poet" by Charles Lamb, and was admired by John Milton, William Blake, William Wordsworth, John Keats, Lord Byron, Alfred Tennyson and others. Among his contemporaries Walter Raleigh wrote a commendatory poem to The Faerie Queene in 1590, in which he claims to admire and value Spenser's work more so than any other in the English language. John Milton in his Areopagitica mentions "our sage and serious poet Spenser, whom I dare be known to think a better teacher than Scotus or Aquinas". In the eighteenth century, Alexander Pope compared Spenser to "a mistress, whose faults we see, but love her with them all." In his work A View of the Present State of Irelande (1596), Spenser discussed future plans to subjugate Ireland, the most recent rising, led by Hugh O'Neill, having demonstrated the futility of previous efforts. The work is partly a defence of Lord Arthur Grey de Wilton, who was appointed Lord Deputy of Ireland in 1580, and who greatly influenced Spenser's thinking on Ireland. Spenser wished devoutly that the Irish language should be eradicated, writing that if children learn Irish before English, "Soe that the speach being Irish, the hart must needes be Irishe; for out of the aboundance of the hart, the tonge speaketh". "'Out of everye corner of the woode and glenns they came creepinge forth upon theire handes, for theire legges could not beare them; they looked Anatomies [of] death, they spake like ghostes, crying out of theire graves; they did eate of the carrions, happye wheare they could find them, yea, and one another soone after, in soe much as the verye carcasses they spared not to scrape out of theire graves; and if they found a plott of water-cresses or shamrockes, theyr they flocked as to a feast… in a shorte space there were none almost left, and a most populous and plentyfull countrye suddenly lefte voyde of man or beast: yett sure in all that warr, there perished not manye by the sworde, but all by the extreamytie of famine ... they themselves had wrought'"
"The Teares of the Muses"
"Prosopopoia, or Mother Hubberds Tale"
"Ruines of Rome: by Bellay"
"Muiopotmos, or the Fate of the Butterflie"
"Visions of the Worlds Vanitie"
Babel, Empress of the East – a dedicatory poem prefaced to Lewes Lewkenor's The Commonwealth of Venice, 1599. Edmund Spenser, Selected Letters and Other Papers. Edited by Christopher Burlinson and Andrew Zurcher (Oxford, OUP, 2009). Edmund Spenser, The Faerie-Queene (Longman-Annotated-English Poets, 2001, 2007) Edited by A. C. Hamilton, Text Edited by Hiroshi Yamashita and Toshiyuki Suzuki. ^ "Spenser, Edmund (SPNR569E)". A Cambridge Alumni Database. University of Cambridge. ^ "The Edmund Spenser Home Page: Biography". English.cam.ac.uk. Archived from the original on 2 January 2012. Retrieved 10 December 2011. ^ Hadfield, Andrew. Edmund Spenser: A Life. Oxford University Press. 2012, p110. ^ Church, R. W. (1879). Spenser. pp. 56–58, 93. ^ Zarucchi, Jeanne Morgan (1997). "Du Bellay, Spenser, and Quevedo Search for Rome: A Teacher's Peregrination". The French Review. 17:2: 192–203. ^ Merritt Yerkes Hughes, "Virgil and Spenser", in University of California Publications in English, vol. 2, no. 3. (Berkeley: University of California Press, 1929). ^ "The English Emblem Book Project | Penn State University Libraries". libraries.psu.edu. Retrieved 21 January 2018. ^ Loewenstein, David; Mueller, Janel M (2003), The Cambridge history of early modern English Literature, Cambridge University Press, p. 369, ISBN 0-521-63156-4 . ^ Prescott, Anne. "Spenser's shorter poems". The Cambridge Companion to Spenser. Ed. Andrew Hadfield. Cambridge: Cambridge University Press, 2001. 143–161. Print. ^ Spenserian stanza at Poetry Foundation. ^ Burrow, Colin. "Spenser and classical traditions". The Cambridge Companion to Spenser. Ed. Andrew Hadfield. Cambridge: Cambridge University Press, 2001. 217–236. Print. ^ Alpers, Paul (1990). "Poet's poet, the". In Henderson, A. C. The Spenser Encyclopedia. Toronto: University of Toronto Press. p. 551. ISBN 0802026761. Retrieved 23 October 2017. ^ Elliott, John, ed. The Prince of Poets. New York: New York University Press, 1968. 7–13. Print. Croft, Ryan J. "Sanctified Tyrannicide: Tyranny And Theology In John Ponet's Shorte Treatise Of Politike Power And Edmund “Spenser's The Faerie Queene." Studies in Philosophy, 108.4 (2011): 538–571. MLA International Bibliography. Web. 8 October 2012. Maley, Willy. “Spenser's Life.” The Oxford Dictionary of Edmund Spenser. Ed. Richard A. McCabe. 1st Ed. 2010. Print. Rust, Jennifer. "Spenser's The Faerie Queene." Saint Louis University, St. Louis. 10 October 2007. No. 6. (December 1993) p. 507–519. Zarucchi, Jeanne Morgan. "Du Bellay, Spenser, and Quevedo Search for Rome: A Teacher's Peregrination." The French Review, 17:2 (December 1997), pp. 192-203. Wikimedia Commons has media related to Edmund Spenser. "Archival material relating to Edmund Spenser". UK National Archives.